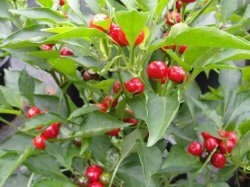 The plant has huge clusters (up to 16 peppers per cluster) of round, turning green to cherry red peppers. It's beautiful enough to be an ornamental but it's delicious and Hot and Spicy. It has that "Island Attitude" to it and will become one of your favorites.